As part of the 2018 Jakarta Civil Servant Candidate (CPNS) candidate recruitment series, Jakarta Provincial Government is participating in the exhibition of 2018 UI Career & Scholarship Expo XXVI at Indonesia of University's Balairung, Depok, Thursday (9/20).
" It aims to net CPNS who are creative and want to develop Jakarta"
It has been held since Thursday (9/20) until Saturday (9/22). 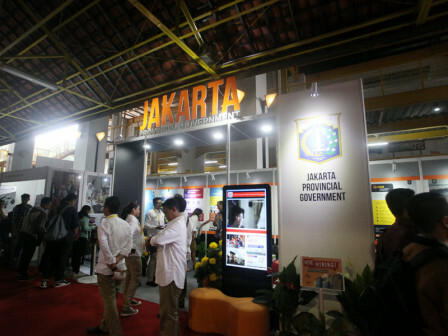 The exhibition displays a number of information related to the method and requirement for becoming Jakarta CPNS, what will be taken if you become CPNS. Aside that, it also provided information about the city government, starting from BUMD up to the construction that is being carried out at this time. "It aims to net CPNS who are creative and want to develop Jakarta," said Triamy Verdita, staff of Jakarta BKD, who is also a representative team of the city government officials, Thursday (9/20). By doing so, there will be many people will know about the opening of the CPNS recruitment. Fauzan, an alumnus of Electrical Engineering said that he was interested in the activity and wanted to work at the city government office. "The reason is I was born and raised in Jakarta so I want to work and develop Jakarta," he stated.